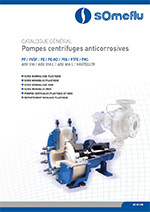 Our centrifuge pumps, specifically designed to withstand the most severe operating conditions, have been installed on mineral chemical, organic chemical and fine chemical plants all over the world. They transport all types of acids, bases, solvents, and usually have their place in all applications that use corrosive products. Built from plastic materials or stainless steel, they meet the ATEX directive using electro-conductive plastics and are available with mechanical seals (single or double with accessories) or with a magnetic drive. Thanks to our experience in the use of technical plastics, our pumps can be manufactured using PP, PE,PEHD, SOMEDUR®, PVDF, PTFE, PFA but also PEEK, giving is unequalled proof of our know-how in the use of technical plastics.